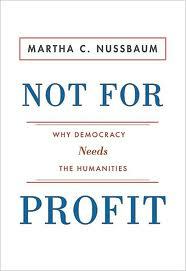 At the risk of perpetuating the curmudgeonly image that several of my earlier reviews may have generated, this week I decided to pick up Martha Nussbaum’s Not for Profit: Why Democracy Needs the Humanities. The book is a manifesto in defense of the importance of humanistic learning, both for its own sake and for the good of society. Nussbaum, a philosopher who has taught at Harvard, Brown, and, most recently, the University of Chicago, provocatively begins the book, “We are in the midst of a crisis of massive proportions and grave global significance” (1). The crisis of which she speaks concerns not the economy, but rather education. Every day schools at every level give less and less time and money to the humanities and more and more to practical disciplines. Whereas once education was geared toward inculcating good citizenship and critical thinking, these days students are often encouraged – by parents, by society in general, by the economic crisis – to see their education primarily as a means to the end of making money. Not for Profit argues against this trend on a number of levels, both philosophical and practical. Nussbaum challenges the emphasis on economics as an indicator of a nation’s development with a shrewdly chosen example: the old South Africa under apartheid was always near the top of the development indices based on the amount of wealth the country generated. And yet few people today would consider the old South Africa a nation worthy of emulation. Nevertheless, the emphasis on productivity persists, to the detriment of our students’ full development. Moreover, this emphasis poses an increasing threat to democracy, as the abandonment of things like literature and the arts can lead to a devaluing of the human person. Following her diagnosis of the problem, Nussbaum offers a prescription for revitalizing education in the interests of preserving the values of democracy. Education ought to be holistic, dealing not only with the life of the mind but also with the affections. Students should be taught to have empathy for the outsider, to have genuine compassion for the other, and to think critically. Nussbaum argues that the most effective method to achieve these goals is Socratic pedagogy. Students must learn to analyze arguments and think for themselves, rather than simply regurgitate information. Moreover, given the nature of globalization, they must be taught foreign cultures and the interconnectedness of economies, a foreign language, world religions, and philosophical theories of justice. Perhaps the most interesting chapter in the book advocates for the indispensability of literature and the arts. Using the Chicago Children’s Choir as an example, Nussbaum relates various anecdotes about how music can break down barriers and generate mutual understanding among people of different racial and socioeconomic backgrounds. The imagination, she argues, is no less important a part of education than the other disciplines that receive more interest and funding. Nussbaum’s final chapter reprises the warning that education is headed in the wrong direction. Science, technology, and the almighty dollar have become gods (my words, not hers), and everyone seems to pinch a bit of incense at the altar. Praising the schools of the Far East, President Obama noted in a 2009 speech on education, “They are spending less time teaching things that don’t matter, and more time teaching things that do. They are preparing their students not only for high school or college, but for a career. We are not” (138). Careerism and productivity, it would seem, are the order of the day. But do we recognize the cost? I found much to agree with in Not for Profit. Nussbaum makes a passionate and in many ways compelling case for the importance of the humanities. As already noted, the chapter on literature and the arts was intriguing. At the same time, I’m not persuaded by every element of her argument. I was a bit put off by her regular denigration of “rote” learning, as well as her near blanket dismissals of tradition and authority. I don’t at all mean to suggest that memorization is the be-all and end-all of education, nor that it can substitute for critical thinking. Nevertheless, I do think that one of the more unfortunate trends in education is the demonizing of memorization. The latter is an essential skill, one by which we learn some things for which there is no other appropriate method. Moreover, much higher order learning depends on the lower level skill of memorization. Similarly, one cannot critique a tradition or an authoritative statement unless one first understands it. I’m sure if pressed Nussbaum would acknowledge this, but I wish she had been more careful with her language. “If we do not insist on the crucial importance of the humanities and the arts, they will drop away, because they do not make money. They only do what is much more precious than that, make a world that is worth living in, people who are able to see other human beings as full people, with thoughts and feelings of their own that deserve respect and empathy, and nations that are able to overcome fear and suspicion in favor of sympathetic and reasoned debate” (143). Fourteen down, (at least) thirty-eight to go. Perhaps you’ve seen the ad campaign for the new search engine, Bing. The basic structure of the ads is formulaic: someone asks a simple question, and the question sets the hearer off on a stream of consciousness, spouting search engine results that have nothing to do with the original question. The campaign is called “Search Overload Syndrome,” and it’s not too far from the reality of what the internet is doing to our brains. 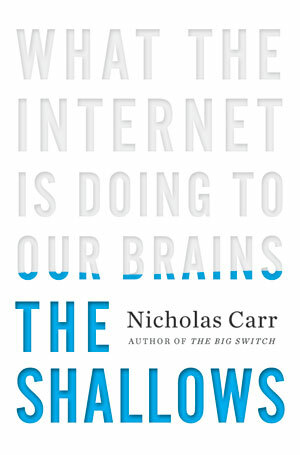 Or at least that’s the thesis of Nicholas Carr in his book The Shallows: What the Internet is Doing to our Brains (minus the reference to the Bing ad campaign). Carr is no Luddite: though an English major at Dartmouth, he has been riding the computer wave since before it really took off in the mid-80s, and he readily admits his addiction to Blu-ray, Wi-Fi, Netflix, Pandora, and YouTube. 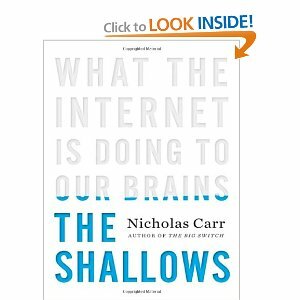 Nevertheless, Carr doesn’t let this addiction blind him to the very real downsides to our growing dependence on multimedia technology, particularly the Internet. As the dust jacket notes, the book is “part intellectual history, part popular science, and part cultural criticism,” and Carr pulls it off with aplomb. Drawing on such diverse sources as Socrates and Plato, Augustine, Nietzsche, Stanley Kubrick’s 2001, and modern studies on neuroscience, he makes a compelling case that the new technologies have negatively affected our capacity for “deep reading,” and thus for deep thinking. Usually when people debate new technology, be it the radio, the television, or the computer, the point at issue is the content the media provide rather than the medium itself. Carr seeks to redress this deficiency. Carr asks not whether the content available on the internet is good or bad – rather, he asks how the nature of the medium affects the way we think. The Internet is not the first technology to alter the way we think. Carr points to cartography and clocks as inventions whose effects extended beyond their original purpose. Maps, of course, were originally intended to help people navigate and reach places they had never been before. Once they came into common use, though, they offered human beings a new way to conceptualize the world. A similar change accompanied the invention of the clock, which led society to conceive of time as discrete units and to construct more precise schedules. Examples could be multiplied. Upon abandoning writing by hand for an early version of the typewriter, Nietzsche noted how the device changed his writing style. With each of these changes, there is both loss and gain. Carr focuses primarily, though not exclusively, on the loss that the Internet has precipitated. In my first post to this blog, I suggested that the Internet generates or reinforces ADD. I made that claim simply based on experience. It would seem that science actually backs this up. According to Carr, studies have shown that the nature of the Net as a multimedia technology actually impedes our ability to memorize and to read carefully. The reason for this is the way our brains work. In a nutshell (and oversimplifying dramatically), Carr describes the Internet as a multimedia “distraction device.” The combination of text, images, video, and audio overstimulates our brains and thus reduces our ability to focus. Moreover, our reliance on technology has impaired our memory, making the act of memorization more rather than less difficult. Unsurprisingly, one of the primary engines driving the explosion in this technology is money. To take the most obvious example, Google has an investment in making us surf the web faster and faster. The more links we click on, the more opportunities Google has to create new ads and thus to make more money. Again, the book is not an anti-technology screed. Nevertheless, Carr does raise some reasonable cautions about where this technology might lead us, and at what cost the information superhighway comes. He also offers some (to my mind sad) prognostications. Though he doesn’t expect the book to disappear completely, he does see society returning to a more stratified literacy, with only a small elite preserving the ability to read deeply, while society at large continues down the path toward shallow thinking. Whether he is right remains to be seen, of course, but the science would seem to support his hypothesis. On the whole, The Shallows is a quick and engaging read. Carr has an easygoing style, and he covers a number of fascinating topics: the development of writing and different media, from clay tablets to parchments to the codex; neuroscience; the thoughts of poets and other deep thinkers on the way the brain works. The structure of the book wittily reflects the nature of internet thinking, with digressions periodically disrupting the flow of the argument. More seriously, he cautions us about the reduction of thought to information and data and the potential loss of our capacity for reflection and contemplation. The book helped explain why my students don’t read books (Carr even quotes a Rhodes Scholar from Florida State – a philosophy major, no less – who says that he doesn’t read books!). It also reinforced my decision to keep this book project going and to limit my time on the web. Moral of the story: get off the blog, and go read a book! Your brain will thank you! Four down, (at least) forty-eight to go.